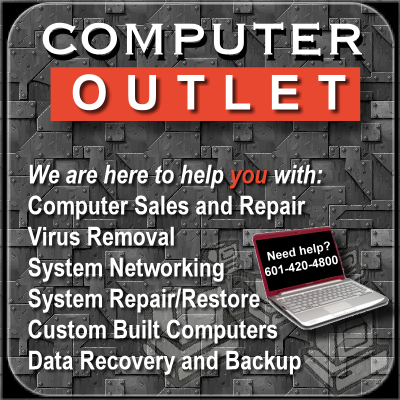 Based in Brandon Mississippi, the Computer Outlet has been providing sales and service to the Rankin, Hinds and Madison county area for more than 15 years. Owned by Curtis Measells, the Computer Outlet is a "one-stop shop" for anything related to computers. We sell the top brands you have come to love and trust, and can service most every make and model. We also specialize in custom built computers. We know that there are many of you who have specific needs for your business and personal computers, and the "out of the box" solution is not enough. Our staff will work with you to determine your specific needs and build a computer around your specifications. This means you are getting exactly what you need and not paying for all the other stuff you don't want! If you haven't talked with us before, please contact us, and see how we can assist your computer needs. We offer warranty service, friendly support, and on-site technical support. We pride ourselves in great customer experiences and are looking forward to serving you.